Imagine a whole book on a single sheet! 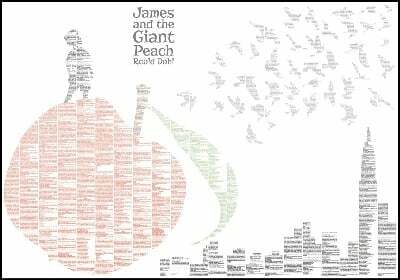 A bold art print on which, up close, you can read the full and complete text of James and the Giant Peach. Roald Dahl's first children's book was published in 1961 and became an instant classic, heralding a career that spanned four decades. The fantastical story of young James Henry Trotter and his magical friends aboard a giant flying peach has enchanted young imaginations around the world and continues to be a delicious treat for anyone. This design features the climactic arrival of the plucky hero in New York and contains every word of the novel carefully arranged on a single page. Comprises 1 sheet, measuring 1000x700mm for easy framing.